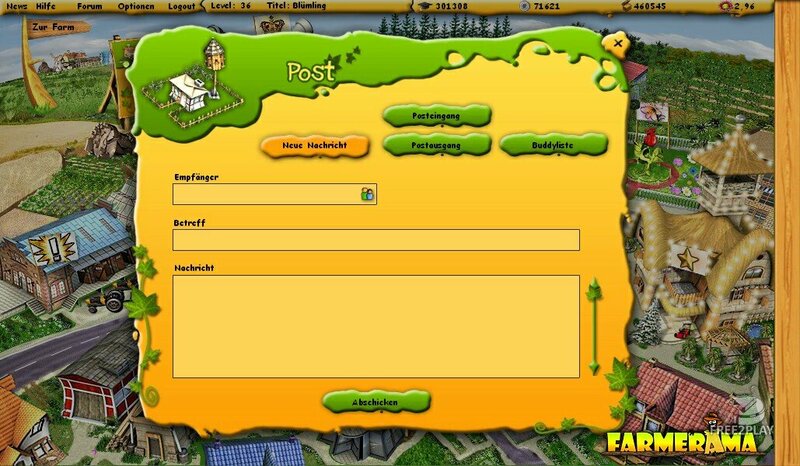 Farmerama is a f2p browser game where you live as a humble farmer. Make the best of life and carefully tend your greatest asset: your land. The city is the source for all your farming needs. You will find seeds, animal housing and trees here. You can sell your produce for a good price and trade with fellow players at the Farmer’s Market. You can even pick up your mail and send packages at the post office, or visit the bank and make a deposit to your account. If you sign up to become a premium farmer, you can visit the lookout tower to get either a lookout or haverster to lend you a hand of the farm. There’s a farmhouse, barn, mill, water tower and manure pile on this field for you to use. 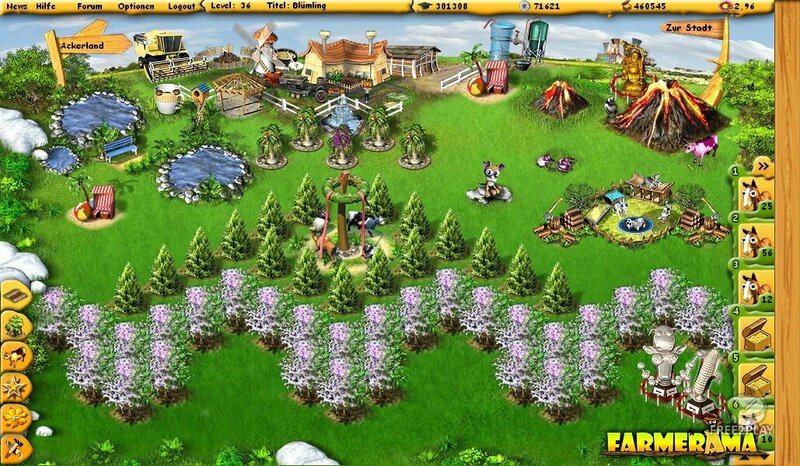 Breathe in the fresh country air and start farming. There’s lots of work to be done and no time to rest! 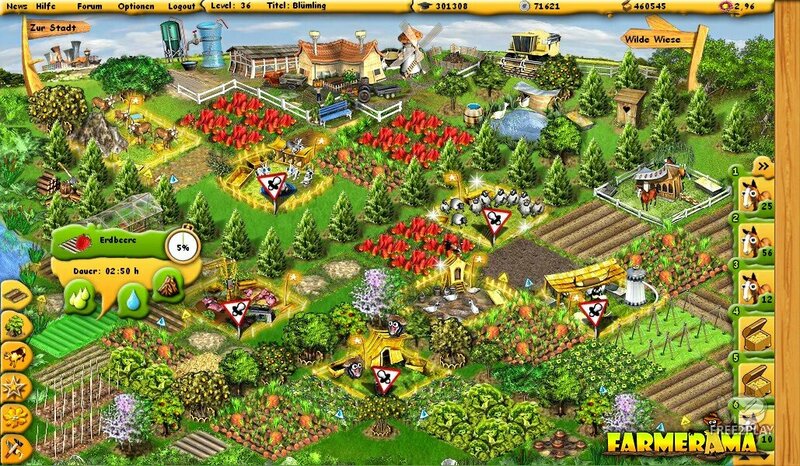 Your field is divided into a grid where you can farm your land, plant trees or raise animals (see “Livestock” for more info about animals). Animals also get hungry. As soon as you’ve put a roof over their head, mix some feed in the mill for them to eat. Just remember, animals can be picky. For every animal, you’ll have to mix a different kind of feed which can sometimes be made up of one or two types of plants. Your animals can’t feed directly off your production, their food must be mixed at the mill. You can only mix feed for those animals you’ve built housing for on your farm. It will take a certain amount of time to make feed. You can only produce one kind of feed at a time. Everything you produce on your farm is stored in your barn. As soon as you’ve harvested or mixed animal feed, you’ll be able to see your goods in the barn. You can also see how many animals you have here. Every farmer only has one barn in Farmerama. Although this building can’t be expanded, you can store as many items as you want here, because it’ll never fill up. Customers swing by the old farmhouse every once in awhile to order goods from you. The more orders you accept, the more delivery points you will rack up. Delivery points will create a constant flow of customers who will want to buy your homegrown veggetables, fruit and meat. Ain’t no doubt about it, the manure pile is one stinky place. But you need fertilizer for your fields so that they’ll grow and prosper. Fertilized fields can also withstand bad weather better. Keep an eye on your manure pile all the time and make sure that you don’t run out of fertilizer. You’ll have to clean out your animals’ stalls and pens on a regular basis, so lack of fertilizer shouldn’t be a problem. Do your part to keep nature in balance! 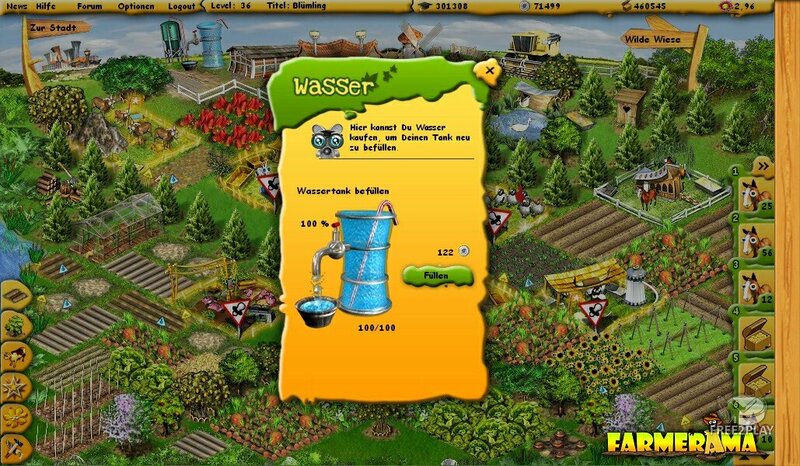 You have a water tower on your farm in order to provide your plants and animals with water. The water tower can only hold a certain amount of water, and once you have used it all you can refill it with Country coins. The water tower can’t be moved. If you need more water, you can also buy additional water tanks and put it wherever you want on your farm. Get your hands on the Premium Pack. It’ll give you some game leverage. With the Premium Pack, you’ll also gain access to the lookout tower! • Now it’s up to the invited player to continue spreading the love. Once this player has accepted the invite, he/she can plant a flower in the community flower patch and ask another player to join.